We spent yesterday morning wandering around downtown: leather jackets, touts for Tango shows and the usual tourist junk. Downtown had what appears to be normal for a Thursday – Protest Day! 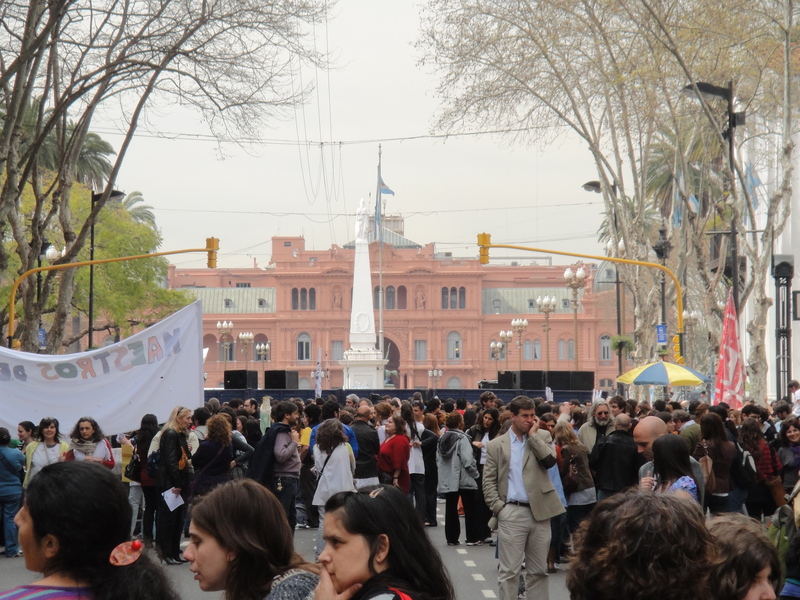 The La Madres were in the main Plaza de Mayo in front of the presidential palace, protesting about their ‘disappeared children’; this links back to one of the many Argentinean military dictatorships. Then there were the random union protests: the students are still holding a sit-in at many of the schools disputing the poor conditions, but today it appeared to be the banks that were the main subject of protest. Every corner we turned seemed to have very bored looking riot police, cigarettes in mouth, closing the roads, before the marchers appeared. Now these are narrow one-way streets so there is traffic chaos and it was quite confronting when a hundred or so protesters appear with banners and loud speakers surrounded by police. Mike wasn’t too keen on trying to pass the mob, but as my Mum will attest to, I love a good street protest so I wasn’t concerned. However, when an incredibly loud blast went off and most people ran into doorways I thought maybe Mike was right. Turns out it was a cannon that shoots leaflets about the protest into the air. The sound ricocheting of the surrounding buildings intensified the sound, startling even the laconic locals. After all this excitement we opted for an early lunch at our favorite parilla (steak house), Del Plata, and then an early siesta before the concert. Once we were all gussied up we caught a taxi to the concert hall. Unfortunately, the protests were still going on at 1930 so we drove into traffic madness; fortunately, the taxi drivers drive like madmen, so after breaking numerous road rules we got him to stop and braved crossing Avenida Nueva de Julio, at eighteen lanes, the widest boulevard in the world. We arrived to find the doors to the Teatro Colon unopened and the crowds discretely milling around the various entrances. This theatre is like His Majesty’s Theatre on steroids, built in the Belle Epoque style in the late 1800s for the creme-de-la-creme to show off their latest couture and listen to the visiting virtuoso. We had the choice of buying tickets in the standing-room only stalls in the heavens, or a private balcony suite with six unreserved seats, the most expensive seating. These were only $50 each, so we opted for the glamour. Well, the wealthy and elite had the same idea we had: be there early and get the best seats. At 8pm sharp the doors opened and there was a flash of pashminas, diamonds, fur and coiffured hair heading to the grand marble staircase. Just the entrance alone is a marvel of domed stained glass windows and chandeliers. Fortunately, the arthritic hips were no match for Mike and I and WE got the best possy. We were shown to our private box which had an area to smarten up in, before passing through velvet red curtains to our seats. The Argentinians love their gilt, so much that even Louis XIV would wince, and more red velvet than a bordello. 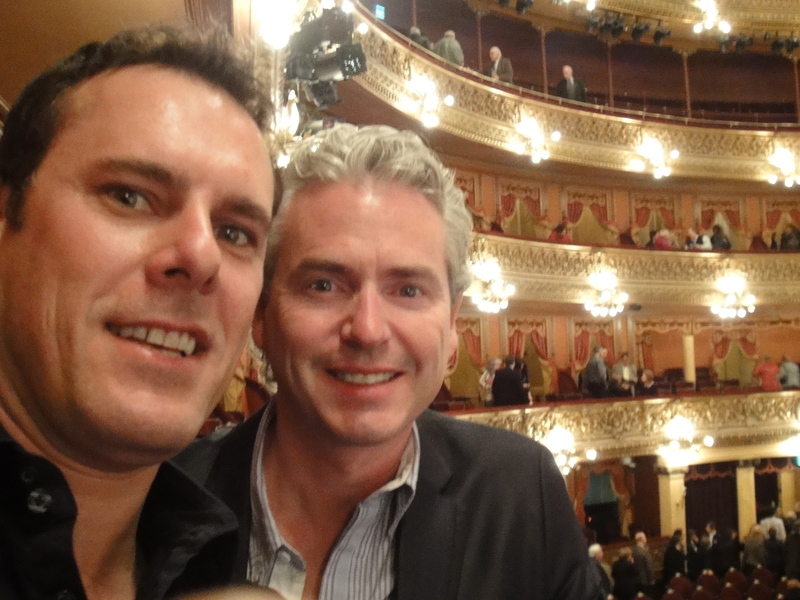 The ornate Art Nouveau style and size of the theatre was breathtaking, six levels of balconies, all private boxes. The standing room only patrons would get a nose bleed – we saw them lining up outside (side entrances), some with their little fold up seats. They had separate stairs, it seems the elite of yesteryear didn’t want to see hear them, let alone see them. The concert was amazing, the orchestra in tails and so close we could read the music. Well I think I’ve gone on enough about that experience, it’s sunny and best I get out into the day. This entry was posted in Argentina and tagged Buenos Aires, Teatro Colon. Bookmark the permalink.